To sweeten our time together, I’ve made yet another batch of blueberry-topped sugar cookie tartlets. The tartlets, I think, will go nicely with this bottle of ice-cold Pinot Grigio. I know you appreciate my superb hosting-skills. Here we are, standing at the garden gate, with a view of the Rose Garden. Not once have I walked the brick paths here without remembering that this 100 feet long, 50 feet wide oasis was formerly a parking lot. As you can see, the boxwood has been neatly trimmed. What you can’t see is that the basin of each fountain has been cleaned. The basins were choked with tree debris, thanks a series of recent storms. 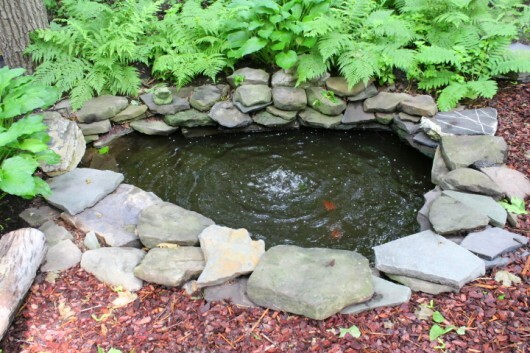 Do you have a water feature in your garden? I hope so. The music that moving water provides is incredibly soothing on a hot day. And by the way, you don’t have to spend a fortune for a water feature. I didn’t. 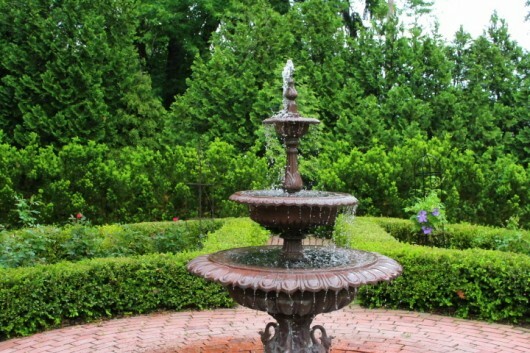 The fountains pictured above (there are two) were obtained for a modest price from a shop in New Mexico. Even the shipping cost was low, because the fountains are made of aluminum, not heavy cast-iron. 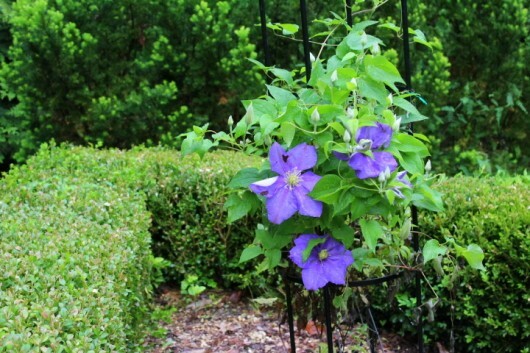 On the other hand, I love purple flowers, like this ‘Anna Louise’ Clematis. Remember that clematis likes to have its feet in the shade, and its head in the sun. 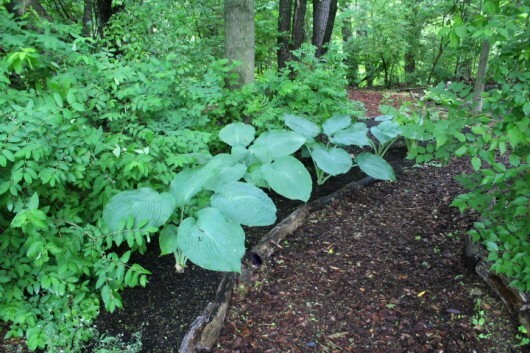 For shade, a thick mulch will do. My rose (and clematis) beds are mulched with three inches of shredded leaves. 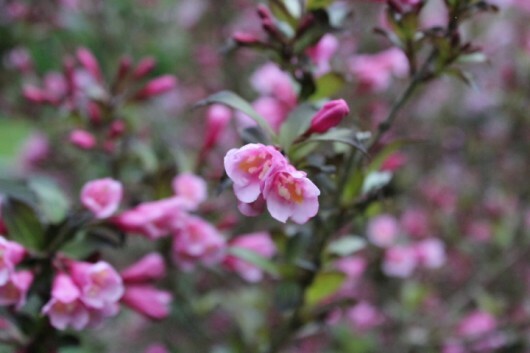 Earlier, I mentioned ‘Zephirine Drouhin.’ A better climber doesn’t exist. 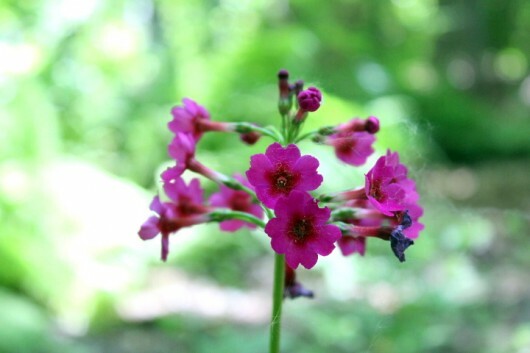 The flowers are deep pink, and strongly perfumed. You can swim in the scent. And get this — the canes are thornless! Zephirine’s exuberant growth helps to hide the ugly shed that stands at the northwest corner of the rose garden. Heading north, we encounter an ancient silver-leaved maple. 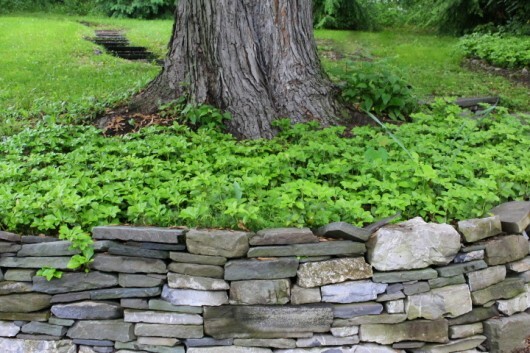 I built a retaining wall around one side of the tree, and planted pachysandra and spring-flowering bulbs there. We are ascending the hill now, which I equipped with a blue stone staircase. To the left of the staircase is a ruby-leaved, ‘Forest Pansy’ redbud. 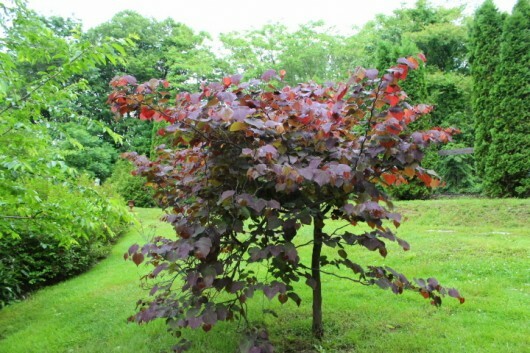 I showed you this Cercis canadensis last month, when it was in dressed in purple flowers. Looking west, from the top of the hill. I carved an opening in a grove of white pines to permit a view of my headless Venus de Milo. How Venus lost her head. Around the corner from Venus is the Kitchen Garden. Are your hot weather crops (tomatoes, zucchini, etc.) creeping along at a snail’s pace? Welcome to the club. I attribute the slowness to our wacky weather. Wacky weather which is, in fact, our new “normal” weather. Smothering the arbor at the rear of the Kitchen Garden are hardy kiwi vines. Last month, I told you that I had planted a male and female plant as directed, to insure fruit. And that the plants must have been mislabeled, because in six years I’d seen nary a flower, let alone a kiwi. But do you see what I see in the picture above? Yes — blossoms! Looks like I’ll be swimming in grape-sized kiwis this summer. As are the ‘Blanca’ currants. I’ll give you a more thorough tour of the Kitchen Garden if and when it really takes off. Opposite the Kitchen Garden is the Pool Garden. I actually skinny-dipped went for a swim this morning. Yes, you may have more wine. You might as well finish off the tartlets, too. Remember, we’re burning calories on this tour! 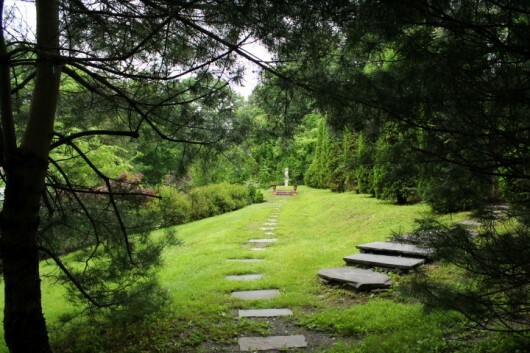 Beyond the Pool and Kitchen Gardens is the Woodland Garden. Shall we step inside? 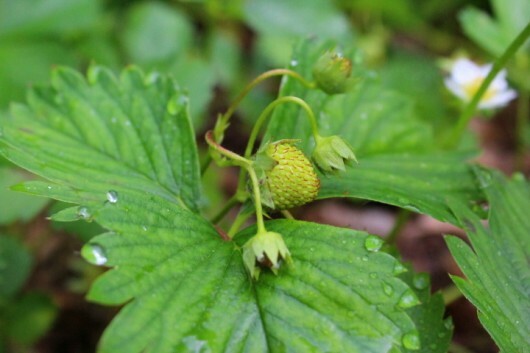 The woodland plants definitely benefited from the 9.25 inches of rain that fell during the final weeks of May. On the left side of the path, just beyond the rose arbor, is Hosta ‘Blue Angel.’ Deer do not like this variety. Not my deer, anyway. 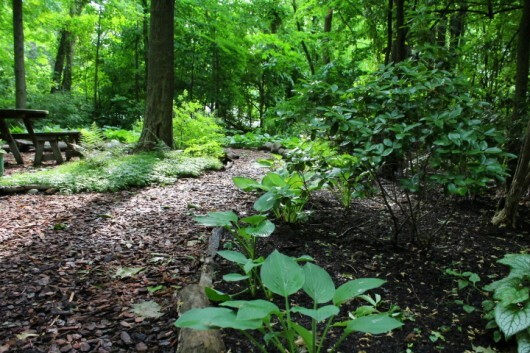 The Woodland features a long, curving “hosta walk.” The green hosta in the foreground is one that the deer will eventually eat. I say let ’em have it. I don’t really care for plain green hostas. Colorful ‘Wide Brim’ is a hosta the deer won’t touch. 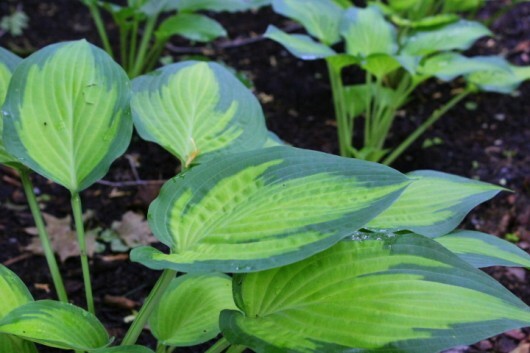 Hosta ‘Paul’s Glory,’ which is similar in color but larger in leaf-size than ‘Wide Brim,’ is also immune to deer-destruction. 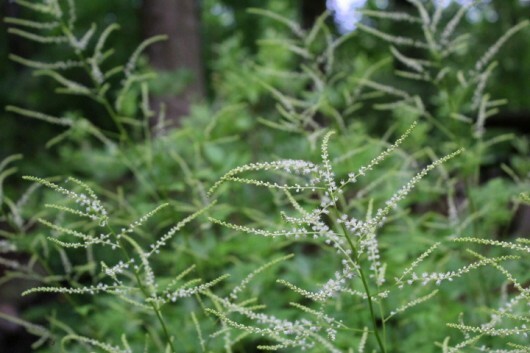 Elsewhere in the garden, a big patch of Astilbe have formed their flowing white spires. 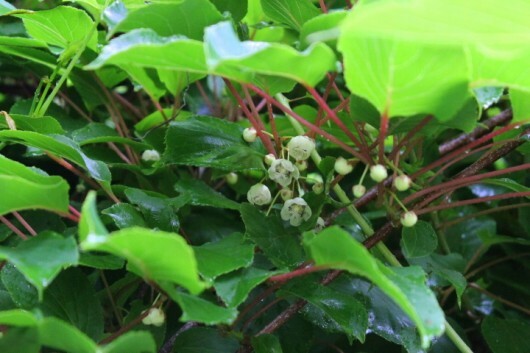 The white buds will open pink in late June. Ferns and hostas form the backdrop to the fish pond. If I can make a fish pond, so can you. Just dig a hole, line it with rubber roofing material, fill it with water, insert a pump, and you’re done. Okay, that sounds like a lot of work. But honestly, it’s not. 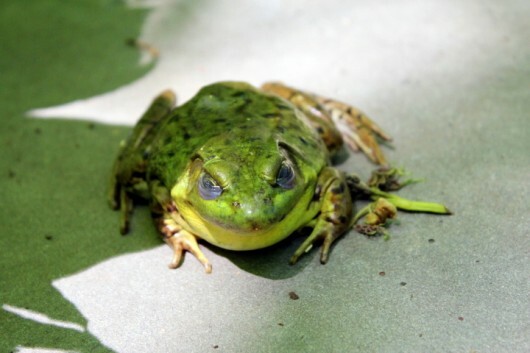 And besides, if you build a fish pond, Prince Charming will pay you a visit. 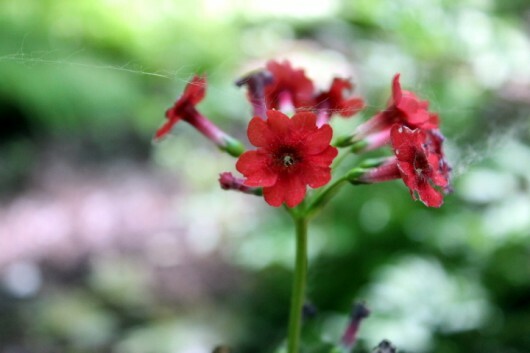 Some of my houseplants are vacationing in the Woodland Garden. 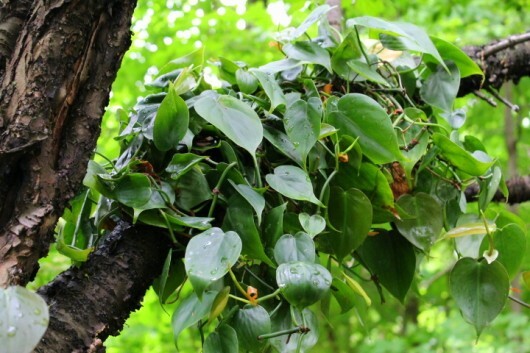 Pictured above are Philodendron vines. 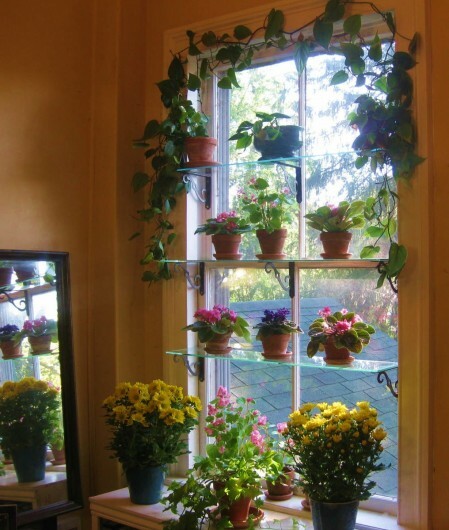 These, in winter, frame my bathroom window garden. The window garden in question. How I designed this horticultural portrait. 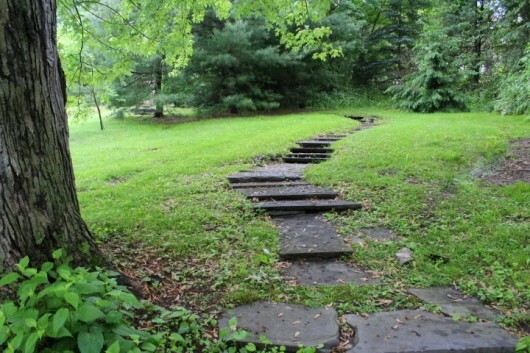 Let’s exit the Woodland for now, and head back to the house via the Serpentine Garden. 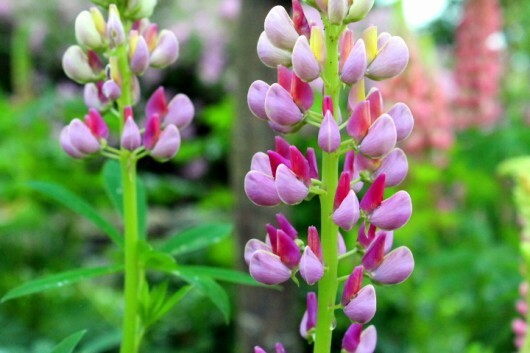 And these Russell hybrid lupines, which come in all kinds of sumptuous shades. Well. I hope you’ve enjoyed this little tour which came complete with drinks and dessert. I know I certainly did. Now, I’d like to hear about your own garden. 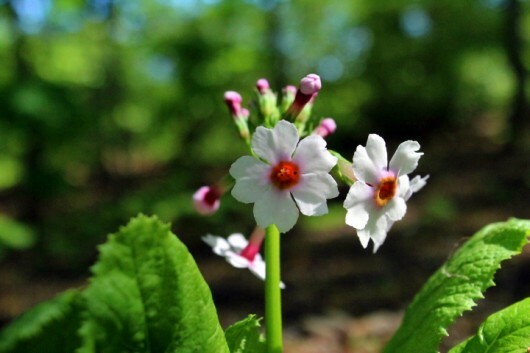 Are your plants blooming on cue? Or are they a few weeks behind because of persistent cold (or just plain wacky) weather? I can hardly believe the beauty that is your garden! It is something that came out of a fairy tale! Thank you for letting me see your paradise! Are you sure your ‘Julia Child ‘ was not mislabeled? Mine are definitely butter yellow with no hint of orange. She is one of my favorite roses! Thank you for sharing your wonderful garden and doing the tour for us. It is just so pretty. I have a Mary rose too. Her fragrance is amazing! I also have a Lilian Austin rose that perfumes the air each morning when I go out for the mail. This year our Willamette Valley weather hasn’t too wet or too hot. The roses, hostas, heucheras, and all the spring bulbs have been magnificent. Thanks for the wine and tartlets! And for the tour. Your gardens are wonderful! Thank you Kevin for the trip around your beautiful garden. The wine was fantastic. I am going outside to my garden now, but I think I need more wine first. Either that or a pair of rose colored specs. You are much too kind! Scott Trudell – After reading your comment, I googled Rosa ‘Julia Child.’ Appears to be the correct variety. Growers use adjectives like “buttery” and “gold-toned” to describe the blooms. the lack of reportage on the “M.R.” lamium or the Persicaria ‘painter’s pallete’ makes me wonder if they didn’t travel well from LaGrangeville to Valatie or the transplanting didn’t take ? Heavens, I hope not…..
Dennis R – Your gift plants (thank you!) 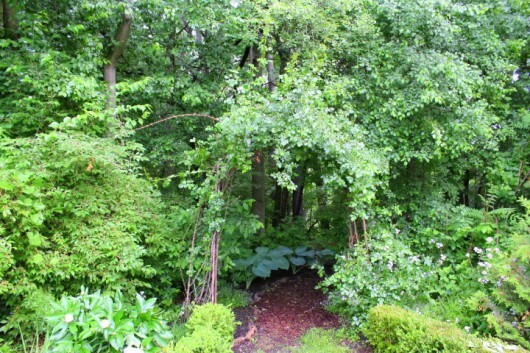 were lovingly transplanted into the Woodland Garden. Waiting for new growth to emerge before photographing. Yet another wonderful intimate look into your gardens! I love orange flowers, and that “Julia Child” is gorgeous…! 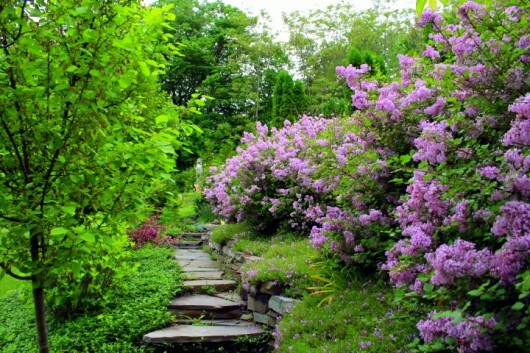 Your woodland garden is really beautiful. I love that you have every facet of sun exposure on your property… a lucky guy indeed! I can’t wait to see your vegetable garden going gangbusters! I hope your open house went well. Thanks for providing the virtual version for those of us outside your lovely Hudson Valley. Here in WI the rhodies and irises are starting to bloom. My red-clombing rose is profuse w/ buds but not yet blooming. I could not find Gertrude Jekyll at my local garden center. 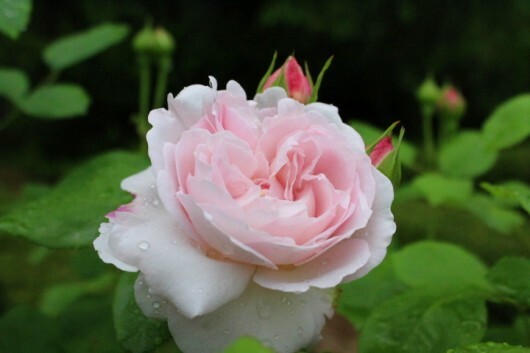 I almost gave in to a white rose named for Milwaukee’s Calatrava (art museum addition), but held my impulse since I only prepared space for one and Gertrude Jekyll is what I really want. 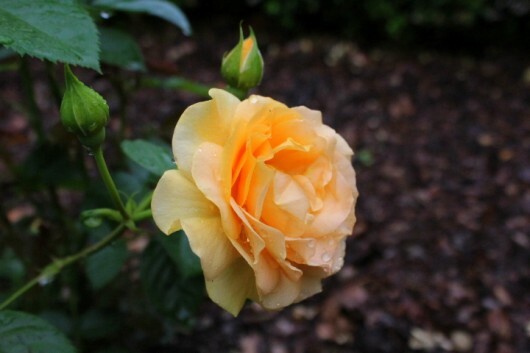 Is it okay to plant a rose in the summer or is it advisable to only plant in Spring? I enjoyed the tour of your gardens. Almost felt I was there walking along the shady path. 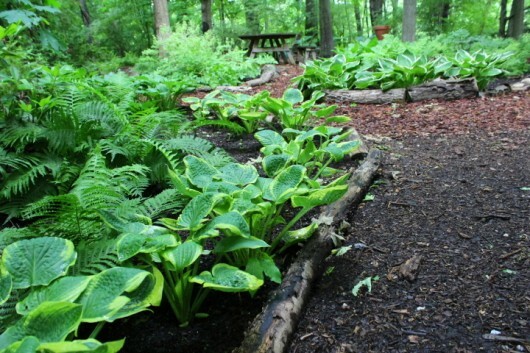 Thanks for the tip on the deer resistant hostas. Have friends who don’t plant hostas because of deer population in their area. Wish I could have tasted the wine and sugar cookie tartlets. Donna B. – Believe me, I can’t wait to see the Kitchen Garden go gangbusters! It seems at a stand-still now, thanks to weird weather. badger gardener – Garden Conservancy Open Day was a success. Had well over 100 visitors, despite the oppressive (95-degrees!) heat that day. 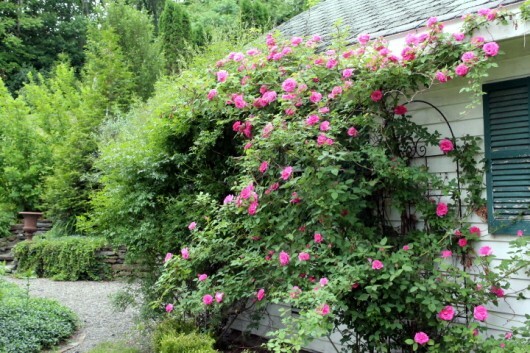 Regarding Rosa Gertrude Jekyll — I’d ask your garden center to order the shrub for you. It is, in my opinion, the best of David Austin’s English roses. A pair of Jekyll flank the gate to my Kitchen Garden — they are in their first flush of bloom just now. The scent is intoxicating. Stella – Thanks for visiting. Now go make those yummy tartlets! Kevin, I love your blog! I discovered you in February. Your recipes never fail me, Lily the Beagle is fabulous, and your house and gardens are amazing. 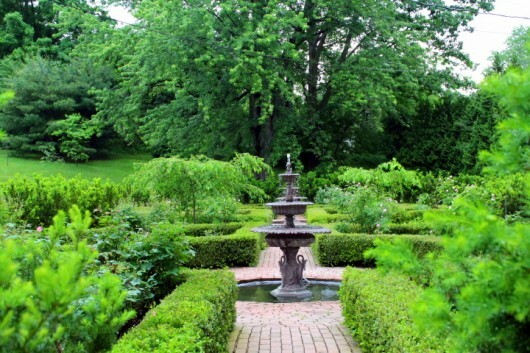 I’m currently planning a parterre for my backyard and would love to include a (reasonably priced) water feature. Would you share the name of the New Mexico shop? Your fountains are grand. Hi Wendy A – I can’t remember the name of the company, probably because the purchase was 9 years ago. Even did a google search for “fountains new mexico” — but nothing jumped out at me. In any event, these days Amazon and Craig’s list are probably the best venues for water-feature-shopping! I am so envious! I so wish I could have a garden like yours but alas, where I live (zone 8) it is not practical. I can only plant heat-resistant and drought-tolerant plants and shrubs. We get 100+ degrees consecutive days and very little rainfall during the summer. In fact we are usually on water restriction and right now we are at stage 3 which means we can only water once a week. It’s very frustrating. Oops! My post was supposed to say “zone 8” not the sunglasses smiley face! Haha! Lovely tour. Thanks for the wine! My warm weather tomatoes, peppers etc. just sit there and look wan right now. You make me want to plant roses…will definitely have to acquire a Julia Child. I quite enjoyed your tour…looking forward to seeing your kitchen garden! Your tour gave me a good start to the day, Kevin. Thank you for the beautiful photos. We have been experiencing a very late Spring with a lot of rain in our area of Zone 4. Of course everything is very green from the moisture, and that includes a lot of weedy invaders which will require a lot of work when the rain subsides. 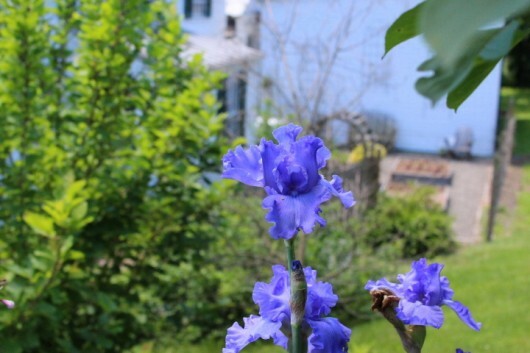 I’m wondering if you have anyone to help you keep your property so beautiful? What a lovely garden! I appreciate your sharing! I am watching my pumpkin plants growing really well ( winter gardening thank you very much! ) but my wildflowers are a lot slower than I thought they would be. Some of my other seedlings are doing well after their slow start. Thanks for the tour of your beautiful garden, I wish I could do something as lovely in mine…. Hi Kevin, I am truly enjoying my garden and certainly at a lower scale than your beautiful sight. Last year I was only able to see it from the inside but this year I am getting down and dirty. I am 71 and love the beauty of it all. I just watched the turtles come to lay eggs on the hill. 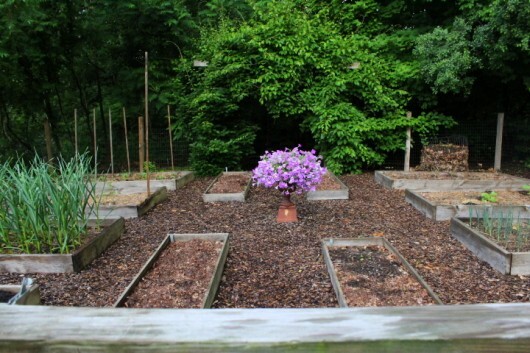 Kevin, your garden is beautiful and shows that there has been a lot of work done—–if you want to call gardening work. I don’t ! Don’t especially care for weed pulling though. I love your woodland garden especially. So calm and serene. I’d love to have a whole plate of lemon tartlets and a comfortable chair to sit in and enjoy the different plants that you have there. Your soup recipe sounds very good. I would think that the spinach gives it a wonderful flavor. I always enjoy your weekly message. Thank you and enjoy the remainder of the summer. It’s going fast. I loved the tour. Everything was beautiful. I especially loved the woodland tour. I love the garden tour ! I think I heard the angles sing that soup looks heavenly ..
Oh boy! I love your roses! I have no such ‘orange flower’ rule at my house. I love flowers of all colors. Your garden is heavenly! 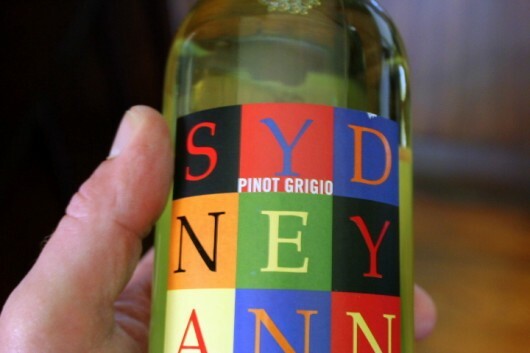 What a refreshing tour, the Pinot Grigio was a nice touch. Its’ a slow bake in Arizona at 108 degrees and gardening now starts at 5am. The kitchen garden will soon be dormant till fall. The only crops growing at the moment are Charentais melons and Thai Suranaree long beans; citrus trees are covered with fruit that will be ready for harvest in January. Harvesting the last of Yukon Gold potatoes, sundrying tomatoes and garlic. All seeds have been harvested and labelled. Cacti gardens are enjoying the shade of the mesquite and Palo Verde trees. Kevin, you have the most beautiful garden. I am english and I see so many flowers that remind me of home, and many of the gardens of stately homes. I cant wait to see your veggie gardens! Os: going to try the watercress soup too! Interesting to hear about your no orange rule Kevin. I have a thing against really warm tones. I do crimson instead of scarlet, etc. I think your Julia Child is more on the cool side of orange if that’s possible. I love the color. I added an orange daylily to my collection this year that I think is stunning. Electric Marmelade Magic: http://www.dianedaylilies.com/daylily/electric-marmalade-magic.html. To me there’s a great difference between the kind of orange that makes you think of the tropics or a sunset and marigold orange. Do these ramblings make sense to you? My kitchen garden is quite sad. I planted cuke seeds 3 weeks ago – 10 seeds per hill and not one has poked it’s head up 🙁 Tomatoes are starting to get some height ( I plant them in trenches laying down so I get lots of roots). Peppers have not grown an inch in 2 weeks. However based on our weather forecast of rain this evening and tomorrow and temps in the 70s all week I spent 6 hours yesterday and 3 hours this morning digging hostas, dividing hostas and planting hostas. 15 ginormous hostas (3 feet in diameter each) yielded 60 hosta-lets. Then I divided and replanted my american gingers, may apples and lambs ear. I also divided my cat mint and yarrow. Busy Busy. Then Luci the rat terrier found a dead something to roll in and she got a very thorough cold water hosing before a bubble bath. I spied some unusual looking iris at the edge of an abandoned meadow yesterday. Thinking about getting up really early tomorrow and digging them up. Too early to dig up iris? Ahh last week I finished my 5 year project of digging up the remainder of a 100′ foot long patch of orange ditch lilies and foisting them off on young, unsuspecting, broke, first home co-workers. Gotta quit this job before they realize what I have done. They were my husbands pre-wife idea of low maintanance landscaping LOL. Awesome! Please keep posting the pictures….beautiful! Lovely! Thanks for sharing so thoroughly. My ‘water feature’ is a creek running along the backside of our property! I used your milk solution to treat black-spot on my roses last year, but it doesn’t seem to be doing the trick now. I’m de-leafing and minding the plants’ base and surrounding ground, but am still fighting a losing battle. I’m coming to live with you if I have to move into your shed! Seriously, though, your gardens are just magnificent, the wine is lovely, and the tartlets are not only scrumptious but cute as well. My raised beds are kind of limping along, but I’m ever the optimist! And although the idea of a water feature is wonderful, i’m afraid it would end up making me run into the house every half hour to use the loo! Hope your dinner party went well. Ummmm Kevin, what is running the fountain pump out in the middle of nowhere in the garden? Is it a solar pump in the shade???? How is it working? I so enjoyed the tour thru your gardens today.. it was much needed and brought me much peace & serenity… I’ve got a gorgeous ‘Zephirine Drouhin, too that has been beat up for the last week or two by rain, rain, rain… however she is still putting out loads of beautiful blooms.. My peonies have been getting battered as well but there are still quite a few more to open so Im hoping for at least a few days of their glory.. My little shaded sanctuary is green and everything exploded hugely this year… My hostas grew to be HUGE this year.. and with the addition of a huge burdock plant that looks like a hosta too, there is no room to even walk thru it to my potting chest.. I need to get out there & do a little bit of cutting back..
Kevin, take a look at my Lily Hill Facebook page to see what we’ve been up to and what’s in bloom. I just pulled all the pink primroses and most of a couple of varieties of sedum from some beds. I like them in early spring, but not when everything else is lush. They always come back every spring! The day lilies are about ready to explode into blooms, and so far the deer haven’t visited. YEAH!! Love Varietus unknownus (mind if I borrow? ), especially since I have, over the years, meticulously labeled all of my roses (> 100 different varieties), only to find that those “permanent” markers aren’t so permanent. One of the many valuable lessons learned. OH DEAR,Jealousy has come over me………..I WANT A PRINCE CHARMING!I have tried the “Z” climber to no avail……..she just did not like my spot i picked for her…….that fact she is so fragrant you say makes me want to try again! Sorry, I missed your swim………….!!! I truly enjoyed the garden tour and had to remind myself a few times that I really wasn’t there! The tartlets were divine! You are so kind to point out when things aren’t perfect. It makes me feel a little less of a garden failure! Our new garden (in the clay) is struggling to get uuuuuuup! Had I known how much clay there was, I would have covered the lettuce and carrot seeds with potting soil, but it’s too late now. A few brave souls have pushed their way through the surface and been congratulated by the durable beans a few rows over (I thought that I heard applause outside my window early one morning)! My biggest surprise has been the African Violets in my kitchen window. They didn’t look very healthy and then the cat broke off a bunch of leaves. Well, ‘I was told’ that the leaves would grow new plants, so I put them on soil and kept watch. Guess what! I have tiny new violets growing and they look wonderful! The mother plant is even looking better and has new blossoms. I think that she is simply ‘tickled pink’ over her new babies! Thanks so much for the recent blog. I am spreading the word about your site and the new PBS series I discovered, Mr. Selfridge! It is based on a real American entrepreneur and I love it, though I am back to waiting for the next season to begin in January 2014. That, plus Downton Abbey, I’ll be in TV heaven! Have a great June and thank you again! Thank you for the updated tour. Your gardens are amazing. I feel relaxed and refreshed just visiting via your visual tour. Keep those posts coming! I am an avid fan. Thanks for such a lovely stroll. My own gardens are pleasurable, scented and floriferous, as well. Favorites showing up just now are cobalt blue Clematis ‘Roguchi’ with its 1960’s hairdo, purplish blue Larkspur to echo Roguchi, historical white rose ‘Madame Plantier’, climbing Rose ‘Westerland’ in orangey-salmon, shocking pink ‘Catchfly’ (Silene), heirloom tall bearded Iris ‘Wabash’, white Deutzia shrubs grown from cemetery cuttings, weighty branches of Snowball Viburnum, variegated pink Weigela and a plethora of annual cabbage poppies in pinks and mauves, mixing poofs and raggedy petal styles in their normal unpredictable way. Begonia grandis is just emerging and promises a good show. The 20 foot row of Black Raspberries will be covered soon in a huge swath of netting, destined to fill the freezer for months to come. When it gets really hot, we can pick twice a day! Purple-stained fingers… and shoes, and blouses, and kitchen floor and mud room carpet. holyoysters! 46 people up and posting today before I got here. Thanks for posting these wonderful pix each week .It is such a wonderful way to begin my day/week. You inspire me to be up earlier and get outside in my weed patch and tame it . I’ll bring my birthday suit for a swim when I come visit . Who gives a royal hoot! . Loved the tour- thank you! Are the hostas that are deer-proof also bunny-proof? The deer cannot get into my woodland garden, but the bunnies seem to be snacking away on hosta leaves. Trudi Dido – Yes, bring your birthday suit. Even if it’s not your birthday. Mary Ann – The pump in the fish pond is electric. I simply buried (about 1 inch deep) a common indoor/outdoor extension cord. The cord is connected to an outlet at the swimming pool. I buried an extension cord for the fountains in the rose garden, too. The fountain pumps are connected to an outlet some 60 feet away. Hi Helen – I have bunnies, too. In 8 years they have not touched my hostas (they prefer to nibble the clover in the yard). 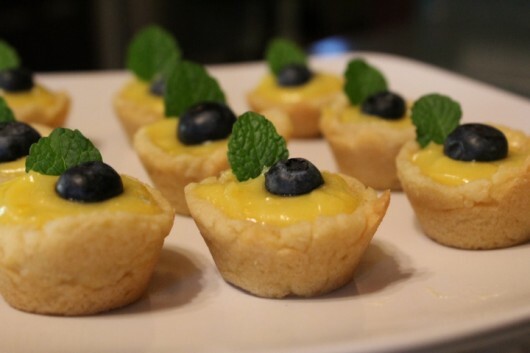 I made your lemon tartlets and used Stonewall Kitchen lemon curd. They were fabulous! 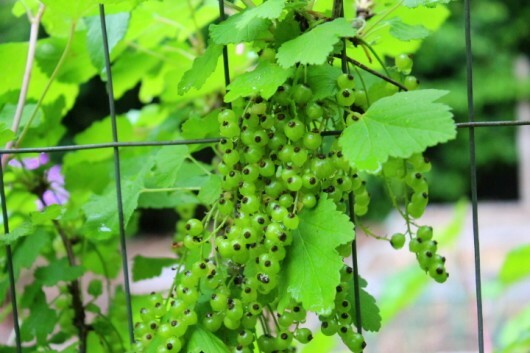 I really enjoy your blog, your garden tours and your recipes! Thanks so much!! Kevin, thanks so much for the tour of your beautiful, beautiful gardens! And the wine and little tarts were the crowning touch. 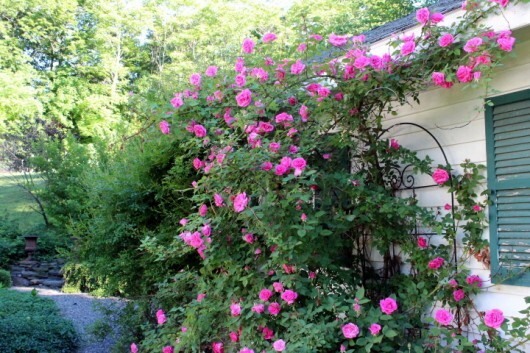 My favorites of the tour are the roses, especially the gorgeous pink climber. My peonies have been blooming this last week, but several days of rain have taken their toll. My one heartbreak this Spring is that my gorgeous, old Wisteria seems to have died. No foliage, just a couple of sprouts along the rotted-out trunk. I don’t know whether to dig it all out or give it another season to see if the sprouts might mean it’s not totally dead. What do you think? I have been busy when it’s not raining planting my porch boxes and the seat of the old rocker that I use as garden decor, plus the wicker planter that I use on the deck. Also, am laying some sod over a place next to the deck where my two-year-old grandsons like to walk along the OUTSIDE of the railing. I had some rocks and pots for flowers there, but I could just see one of them falling and bashing his head or landing in a pot of flowers! The things we give up for the children! But then, soon they’ll be grown and I will be free to do as I like with that area, but perhaps lonelier as they will prefer their friends to Grandma Omi. I do love a garden walk! Oh what a delightfully beautiful walk it was. Picture say a thousand words and the photos were lovely. However, I would love to see the gardens in person. I can smell the roses. I have a Japanese Lilac Tree on our parkway and the fragrance from it is wonderful. Brought some cut branches indoors and it really scents the rooms. My tomato plants are slow going but the last week or so they are beginning to get going. Yup, some crazy, crazy weather here in Downers Grove, IL. Summer is just a day away. Yipee! Thank you for sharing your gardens. When I take your tours,I stop my reading and close my eyes and can almost smell the delicious scents of your gardens. Thank you so much for the Tarts and Wine as well! Kevin, What a beautiful garden you have! It’s an inspiration and I also appreciated your humor (“varietus uinknownus” I also have a few of this variety) and how you make me feel welcome and included in all it’s beauty.